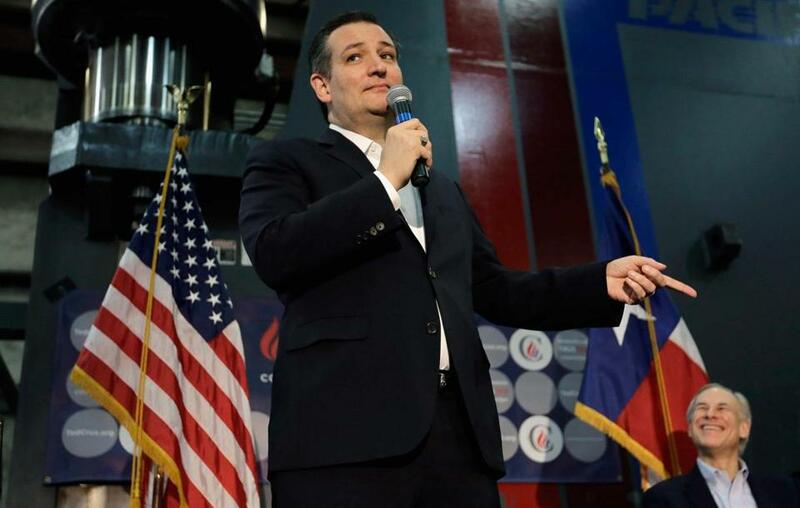 To win the nomination, Ted Cruz will somehow have to go from having 5 percent of GOP delegates to more than 50 percent in the next three months. US Senator Ted Cruz has a math problem that could doom any chance he has of winning the GOP nomination. Following the Nevada caucuses, Donald Trump has 66 percent of the nominating delegates that have been doled out so far. To win the nomination, Cruz will somehow have to go from having 13 percent of the delegates to a majority of them in the next three months. The question: Mathematically, how can Cruz pull it off? The answer: It is nearly impossible, largely due to the rules of the GOP nomination system. On the night of the Nevada caucuses, where Cruz came in third, he declared March 1 would be the most important date in the primary season. That’s up for debate, but this Tuesday is certainly the most important day in his campaign. On March 1, a large swath of Southern states — from Georgia to Cruz’s home state of Texas — will vote in the so-called SEC primary, named for the Southeastern college athletic conferences with teams in many of the states that vote that day. On the surface, these states arefilled with potential Cruz supporters who are evangelical and conservative — states like Alabama, Louisiana, Oklahoma, and Georgia. In theory, this would be the date when Cruz grabs so many delegates he could overtake Trump. But the Republican National Committee stipulated these 11 states must award delegates proportionally (instead of the winner taking all of the delegates). This makes it nearly impossible for Cruz to get ahead in the count. US Senator Marco Rubio has a problem finding a state primary or caucus that he can win outright. But at least his strongest states, in theory, are winner-take-all contests, although they come later on the calendar. Even if Rubio barely wins the Florida primary on March 15, he doesn’t have to share the state’s 99 delegates with anyone. For this same reason, the delegate count doesn’t get much better for Cruz later in March. After Super Tuesday, the list of states voting — Michigan on March 8, Illinois and Ohio on March 15, for example — are less friendly to his politics. David Wasserman of the Cook Political Report found that just 22 percent of the winner-take-all primary states had a greater than 30 percent evangelical population. One way to read this is to say that it is better, mathematically, to be an establishment lane candidate like Rubio than Cruz. But it’s more complicated. Rubio needs to quickly raise money to compete with Cruz and Trump in the large number of states (and media markets) voting in March. Rubio will also have to maintain some political argument about why he should be a viable candidate if he doesn’t win his first state outright until March 15. Republicans did not intend for it to work this way. The Southern states voting March 1 wanted to be in a cluster early on the calendar to help a more conservative candidate clinch the nomination. But in a three-person contest, where the front-runner isn’t the social conservative, their attempt has appeared to backfire. Unless Cruz pulls off the most impressive Super Tuesday victories in the history of competitive primaries, he will be severely disadvantaged in the delegate race this spring. James Pindell can be reached at james.pindell@globe.com. Follow him on Twitter @jamespindell or subscribe to his daily e-mail update on the 2016 campaign at bostonglobe.com/groundgame.